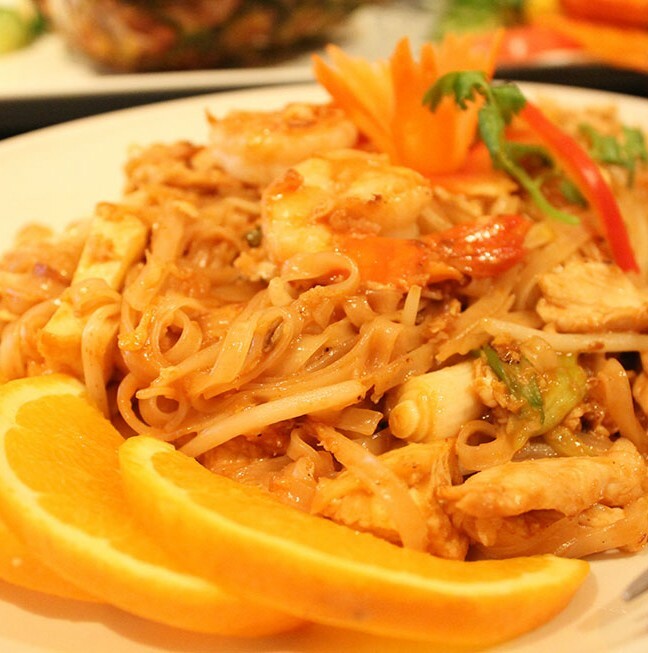 One will not find Kingston lacking for choices in Thai food, but if you are inclined to wander off busy Princess Street onto Sydenham Street downtown, you may perhaps find a spot you have not tried. 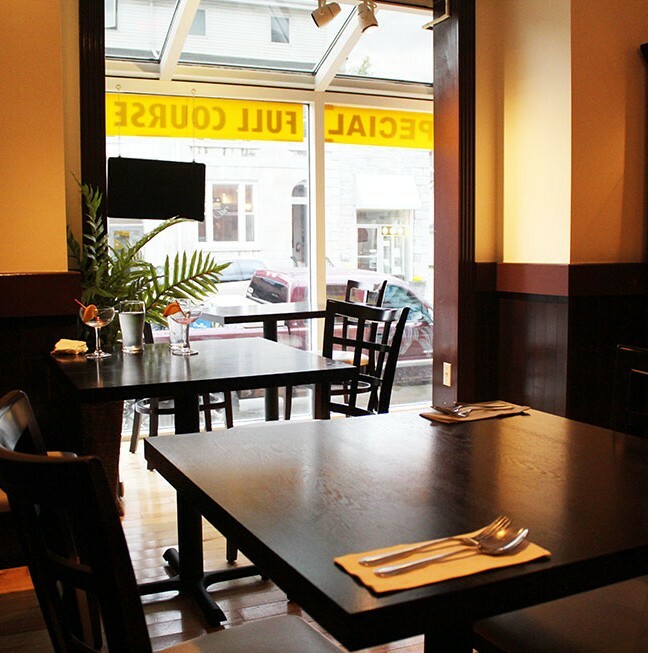 Peering into its inviting windows, you will encounter a restaurant perfect for a quick weekday lunch or a quiet spot to have a date or catch up with friends. Locals have become familiar with this relaxing and ambient spot that has become popular for its affordable prices and high food quality. Spacious seating in a beautiful space. Natural lighting filters through the floor to ceiling front glass window. 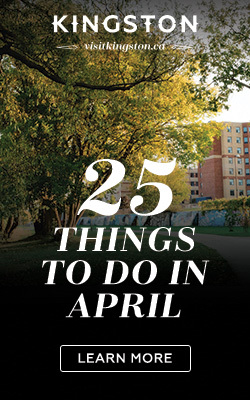 If so inclined, you can even people watch while eating! Encompassed by natural light and wood-panelled walls, patrons can sit comfortably at spacious tables to enjoy their meals. 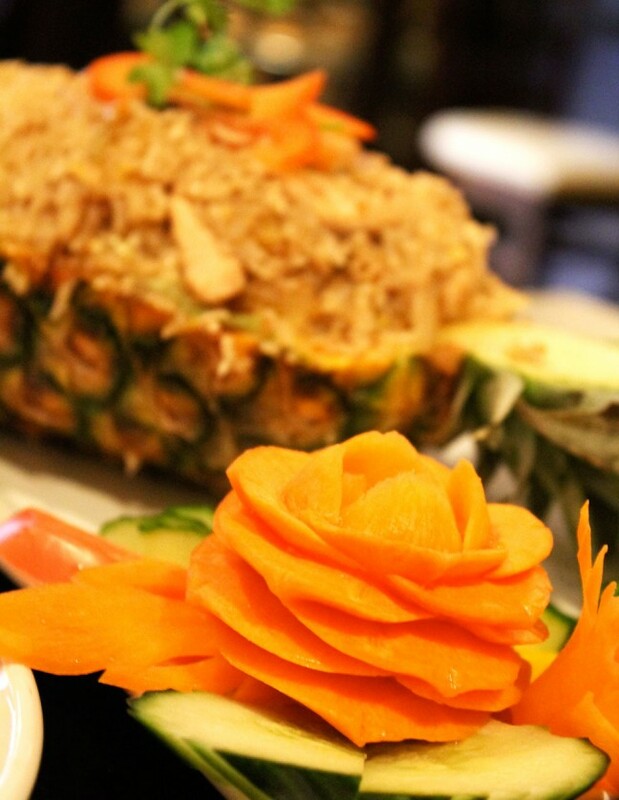 There is a natural calm and serenity that sets even the busiest mind at ease once you enter the doors of Thai House Cuisine. Nattiya and Dow, the two servers, welcome me with great suggestions of customer favourites and dishes to try. 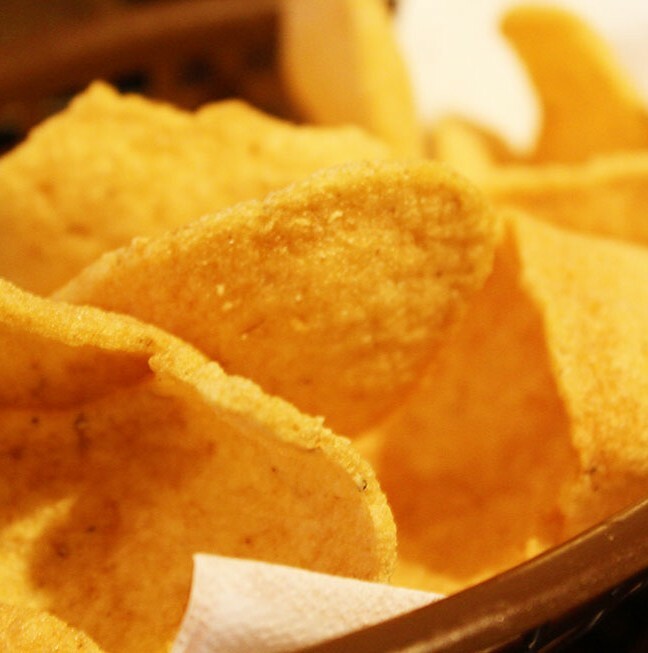 I start with the crispy shrimp chips that accompany all dinner meals. The crunch of the chips is just enough to whet my appetite for what was next to come. Crispy shrimp chips to start off the meal. Though I am usually not a fan of deep fried items, It was insisted that I try the deep-fried shrimp. 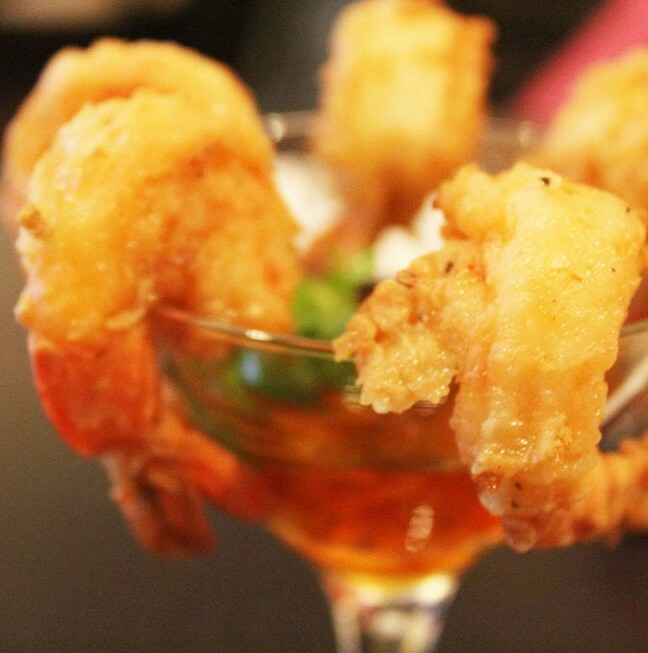 This dish of tiger shrimp was perfectly marinated and fried, and perfect with thai sauce. It was bittersweet to only have a few, but I remembered this was only the appetizer! 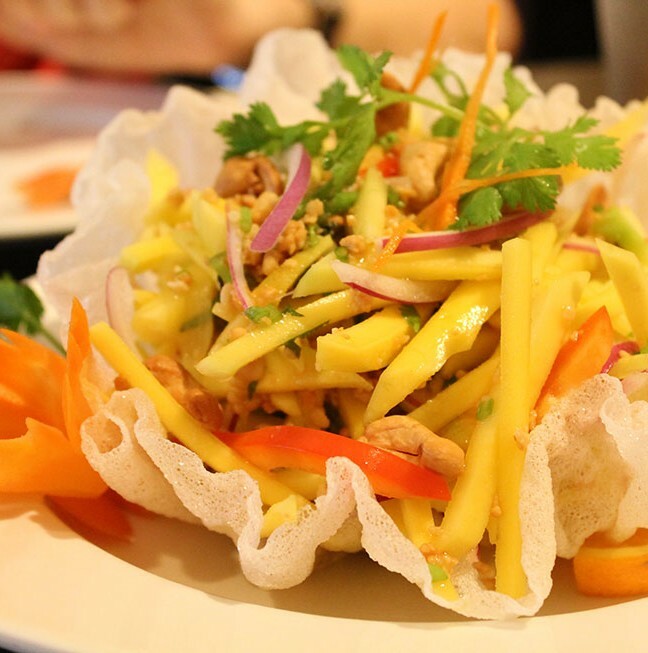 Next I tried the Mango Salad – an amazing explosion of fresh flavor in your mouth, perfect as a summer salad. Shredded young mango is mixed with red onions, sweet peppers, bell peppers, mint leaves and coriander, creating a concoction of sweet and savoury all at once. 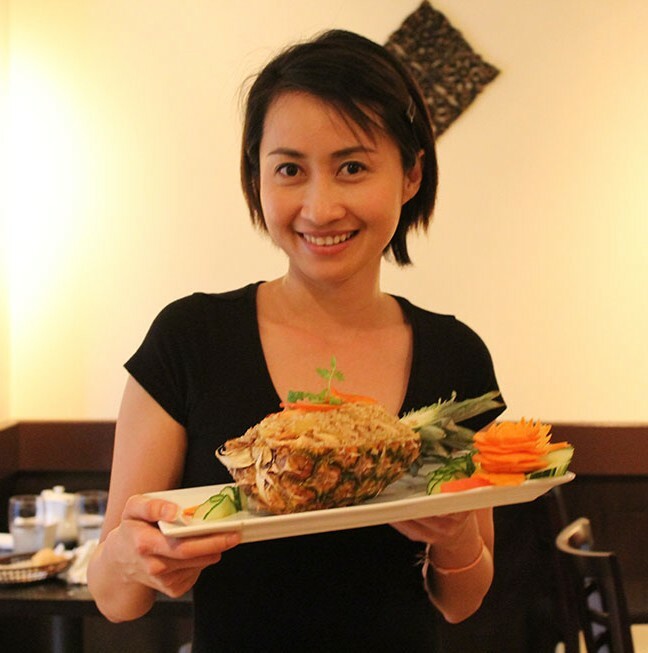 Encased within a crispy rice paper, it is topped with cashew nuts and peanuts for the finishing flourish. I was hooked from the first bite of this tantalizing salad with a perfect crunch to it. I went for the Pineapple Fried Rice, after Nattiya pointed it out at the next table. I was curious how all the flavours would come together, and intrigued by the dish coming in a halved hollowed-out pineapple. I usually am quite picky with the finished texture and softness of rice, but in this case, the pineapple fused beautifully into the shrimp and chicken and rice to create a slightly sweet dish. It was also a delight to examine the delicately cut and crafted food art made from carrots and cucumbers – what patience and artistry! Looking for a summer fresh salad? Try the Mango Salad! No detail is left out. I could not leave without trying their Pad Thai, as I have an ongoing mission to compare all available pad thai dishes in Kingston. Though not the best I have tasted, Thai House’s pad thai still hits the spot and offers perfectly stir-fried rice noodles with a generous amount of tiger shrimps, chicken, and tofu. Again, presentation of this dish came with a carrot and parsley flourish on the top as well as orange slices on the side. With a fully belly, I could not handle dessert this time around, though their sticky rice with jack fruit is one I eyed over at the next table – looks like I will have to be back again very soon! Overall, I was impressed by the attention to detail both in presentation of the food as well as the quality of ingredients. 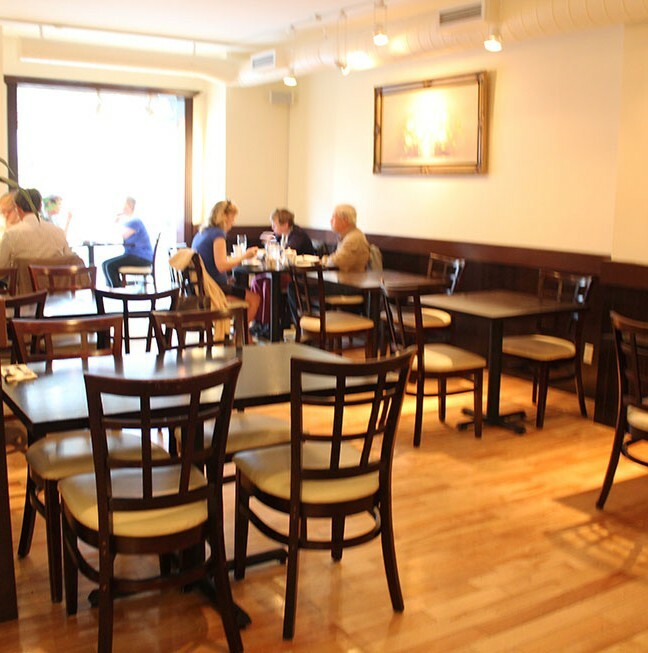 With ample seating, there is usually no wait, and service is efficient. It is a great spot for lunch or dinner, and offers enough variety for foodies of any kind. Fresh Rolls – Looking for an alternative to spring rolls? Try this alternative with tofu, egg, carrot, lettuce, and coriander in rice paper! Appetizer Assortment – If looking to share and try various options, this option of chicken satay skewers, spring rolls, fresh rolls, and calamari should be a good start! Red Roasted Duck Curry – Roasted duck in red curry sauce; has a bit of a kick to it! Tamarind Fish – If you are looking for something new to try, this rainbow trout dish is dressed in the house tamarind sauce. Be ready for strong flavours! Visit in person at 185 Sydenham Street, Kingston, Ontario.